I wanted to recreate a favorite from California Pizza Kitchen and I think this Pear, Gorgonzola and Hazelnut Pizza with Mixed Greens was right on the money. It’s light, so tasty and pretty to boot! There are two pizzas that left a lasting impression on me in all the years I’ve had pizza. The first was at Bonnie Brae Tavern, a long time establishment in the beautiful old Denver neighborhood of Bonnie Brae where I had the first pizza in my life without tomato sauce and I was in love. So in love I never went back to red sauce and sausage. Olive oil, mozzarella, garlic and artichoke hearts had made my day and started a trend for me I’ve never abandoned. Olive oil, cheese and nuts seem to be a constant with either a companion fruit or veggie but I have to say when I first met this Pear, Gorgonzola and Hazelnut Pizza with Mixed Greens I thought I had found my true nirvana. A new pizza place had opened at a new mall and my daughters were eager to go. Called California Pizza Kitchen, it was light, bright and nothing at all like ‘pizza joints’ of our experience. While standards were on the menu, I always found that I was drawn to more unique combinations and this is the first pizza I tried there and I’m thinking that 15 years later it might still be the only one I’ve ever ordered too. Pears, sweet caramelized onions and toasted hazelnuts are topped with chilled greens and served with house-made Gorgonzola ranch. I have not been to California Pizza Kitchen in a long time but it wasn’t hard to source the ingredients from their menu and I’m glad I checked because I might have forgotten the caramelized onions and that would have been a shame. I did wing it a bit and for good reason. The pizzas I’ve order at CPK were individual size and I was making a large pizza. I decided to have the base just be cheese, caramelized onions and pears and serve people enjoying this pizza along with me just topped with the salad, and if they chose, the toasted nuts and Gorgonzola cheese. I learned a long time ago…those two things are so determined by personal preference and I wanted to make sure my friends enjoyed this too. Research has CPK call the dressing a Gorgonzola Ranch dressing and one site I found hoping to find a recipe suggested mixing Ranch dressing with some Gorgonzola cheese. Nope, can’t do it. I don’t have any ready made dressings in my fridge so I whipped up something of my own with mayo, buttermilk, sour cream and Gorgonzola and I’m delighted I made more than I needed; it’s so good! Let’s talk about pizza dough. I’ve made my own dough but to be honest; it’s not for me. Pizza is more often a spur of the moment thing and the hours it takes to make dough would change that dramatically. On the opposite end of the make it yourself spectrum are the rolls of dough in the refrigerator case at the grocery store. Though I will use some of those products I just don’t like the pizza dough; for one thing I like a round pizza, after all I have a round pizza stone. So I wanted to share my passion for the Venice Bakery pizza dough I find at Sprouts in the freezer case. Yes you have to let it thaw and directions say best if overnight. Then the next suggestion is a couple of hours on the counter. OR? What I did was to defrost it in the microwave first . For one pound of dough I put in specs for just one/half pound. Then I turned it over and did it for one/quarter pound. I did not want it to get warm at all. Then I rubbed it with some olive oil and put it in a bowl and then covered it and put it into an oven I had preheated and then turned OFF. Took about an hour and it was at least doubled in volume and worked like a charm! I love this pizza and even more I love that I can have this pizza without a trip to Park Meadows Mall. It’s quite a bit further from me since a move a couple of years ago so my ‘quick’ trips there which might have included a lunch stop are rare and now I have one more favorite I can make at home. Score! Fresh greens; I used a combination of Romaine and Radicchio; mixed greens would be nice too. Preheat oven to 400 degrees and spread the pizza out on a pizza stone or baking sheet. Sprinkle 1 1/2 cups mozzarella cheese on the dough and top the cheese with the cooked onions. Place the pear slices on top of the onions in a circular fashion in two or more rows and top with the remaining cheese. Bake for 20 minutes or until top is nicely browned. 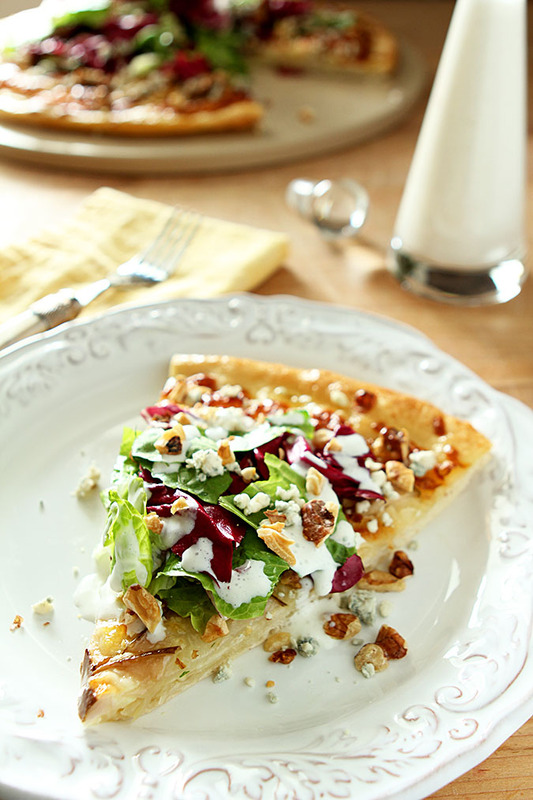 Remove from the oven and top individual slices with the greens, toasted nuts, Gorgonzola cheese and dressing. A discerning eye might notice those are not hazelnuts in the photos. I sure thought I had some but when I discovered there were none in my HUGE box of what I think must be every other nut imaginable, I decided to punt and use walnuts. Because I provide the title of my post and the URL to Food Network a week in advance and didn't want to make everyone have to revise their info...I let it go. Truth be told? The walnuts were great so if you're like me and have a huge bag of walnuts and no hazelnuts in sight? Go for it! This is by far my favorite pizza. Ever. Thank you so much for posting your experimentation and your results. I recently moved from the city to a more rural area lacking a California Pizza Kitchen and I crave this pizza. I cannot wait to try this recipe. You seriously made my afternoon! That’s good to hear! I love it too and a move I made puts CPK a good half hour from me now and I haven’t been in a long, long time. It’s my favorite too; not unlike a salad with similar flavors that I always get at Nordstrom’s Cafe; there is something about the pear and gorgonzola that are just perfect together isn’t there? So glad I could help…that’s my dream! Wow! This looks amazing! 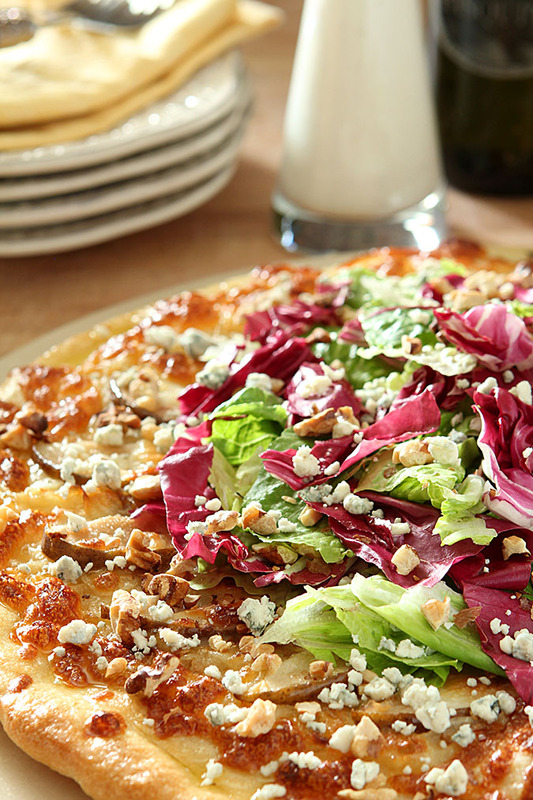 I would try making these pear, gorgonzola and hazelnut pizza with greens​ for sure! Can I post it on my blog? That pear, gorgonzola and hazelnut pizza is so Instagrammable and adorable! As you know, I made it a short while ago, and it was lovely! Thx for sharing! And thank you for letting me know…it’s one of my favorites. This pear, gorgonzola and hazelnut pizza just looks so incredibly delicious and I am so craving a slice right now! And now I am too Bella; it truly is a huge favorite of mine. Definitely your pear gorgonzola hazelnut pizza recipe is awesomeness! This is a great recipe, as you know I made it a short while ago and it was lovely, in fact have made it again since. Thanks for sharing! Thanks Jill…so glad you love it too. Of course now I am absolutely craving it and not a pear in the house..that must change! This is a lovely healthy salad served up on a delicious pizza crust! I could eat this every day Paula…as a matter of fact I think I did for 3 days…which is fine by me; I LOVE leftovers! I am a pizza lover from way back and this one is calling my name – it’s beautiful Barb! This looks beyond amazing – can’t wait to try it!